Other than the beautiful portable model, Goldstar (or better, LG Electronics as it is better known now) made a couple of desktop CD-I player too. These aren't very easy to found, so if you find one, well... buy it! 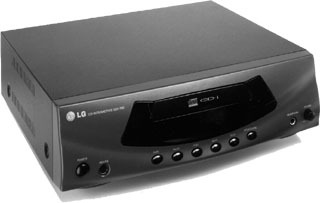 The Goldstar GDI-700M Desktop CD-Interactive Player. This new addition to the line has many features found only in the most expensive CD-i players on the market, but at a price point far below the competition, making it the ideal player for both professional and education applications. It features front loading, integrated MPEG, head phone jack with volume control, CD-i Mouse port, 25 pin true 28.8 baud serial interface, a parallel printer port, integrated IR control , PAL / NTSC switchable, 110-240 Volt operation, a metal chassis and a very competitive price point. The system was priced $499.00. 75, 150, 300, 1,200, 2,400, 4,800, 9,600, 19,200, and 38,400 Independently programmable baud rate for receiver and transmitter. The Goldstar GPI-1100M Portable CD-Interactive Player. Here is LG Electronics official description of the product. This recent addition to the line, is probably the finest and most compact CD-i player for POI Kiosks. This player now available for quantity purchase has some very special features. It is only 7.5" wide and 6.72" deep, making it the smallest player with all of the features necessary for kiosk applications. It also has a ball bearing disk clamping design enabling the disk to play while in the vertical position. It has an auto power on feature and now comes with one control port and a high speed serial I/O port able to sustain speeds up to 38,400 Kbps. With integrated MPEG and built in Video, Audio and S-Video outputs, this is the most complete player for the money. The system was priced $699.00. Another pic of the same Portable model. This model was firstly reported to me by Steve Murphy of St. Louis. Thanks a lot! 75, 150, 300, 1,200, 2,400, 4,800, 9,600, and 19,200. Independently programmable baud rate for receiver and transmitter. It seems there was at least another Goldstar CD-I player on the market. A reader, Stacy J. Dunkle, told me a discovery made on a USA thrift shop: a GD CD-I unit virtually identical to the Philips Cd-I 450. More soon!